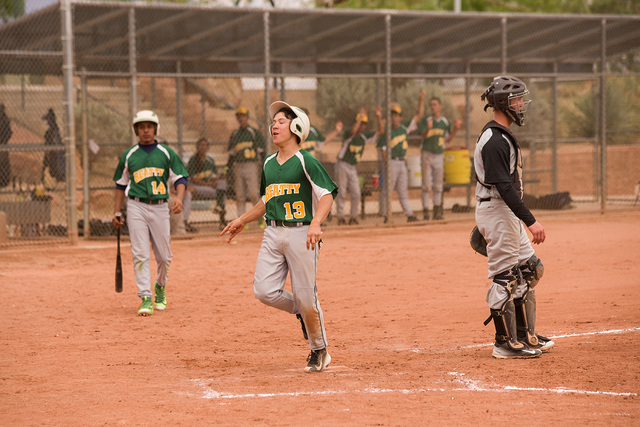 Hornets baseball played Spring Mountain last Friday and split the doubleheader, winning the first game 13-12 and losing the nightcap 8-1. Also in non-conference action on Tuesday, Beatty traveled to Arizona and swept Beaver Dam 16-2 and 15-11. In the Spring Mountain game, Beatty coach Mark Henderson said pitching was shaky in the first inning of the first game. Henderson said the game came down to the last inning. The score was 8-10 in favor of Spring Mountain at the top of the seventh. The Hornets had a 5-run seventh inning. The run production started with two outs. The Hornets had two on base and Isias Femat singled in 2 runs to tie up the game up at 10-10. Then Matt Reetz singled, followed by Hugo Mendoza, who singled in 2 more runs to go ahead 12-10. Samuel Cardenas walked and he and Mendoza stole second and third. Damian Reynoso hit the ball sharply to the third baseman who tried to tag Cardenas going to third from second, but Cardenas held up and kept the third baseman from making the tag until Mendoza scored from home to make the score 13-10, which was just enough to win the game. Henderson said in game 2, the Golden Eagles dominated. A key to Beatty’s defense will be cutting the amount of errors per game. 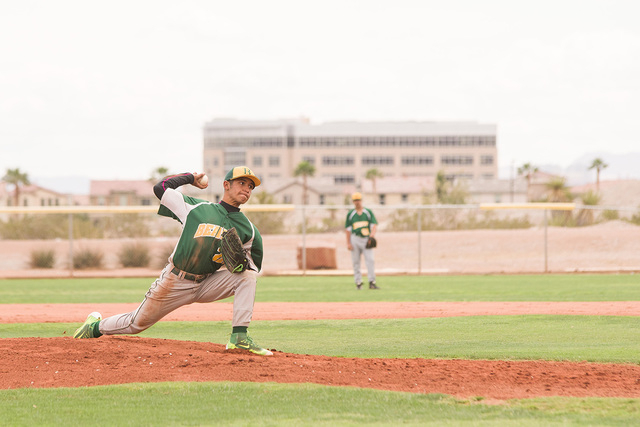 “The Hornets defense had 11 errors on the day, but also had three double plays that got them out of some very tough innings,” the coach said. The Beaver Dam game demonstrated the offensive potential of the team. In game 1 the Hornets had a 13-run inning. Saul Damian had a strong pitching outing, 4 innings shut out, 2 hits with 6 strikeouts. Freshman lefty Jacob Henry came in for the last inning and gave up 2 runs on 3 walks, 2 wild pitches and 3 strikeouts. Defense was solid with 1 double play and no errors. The offense had 16 runs, 8 hits, 5 walks, 6 hit batters and 3 reached on errors. Hugo Mendoza 3-4, 2 runs, 7 RBI’s, with a grand slam HR; Matt Reetz went 1-4, 2 runs, double, 3 RBI’s; Josh Hopper went 1-4, 1-2B, run and 2 RBI’s; Armando Gonzalez went 1-4, 1-2B, 4 runs, 1 RBI, Nik Zamora scored 3 runs. In game 2, Beatty scored 3 runs in each of the first two innings and 5 runs in the fifth, along with scattered runs throughout the game. Beaver Dam scored 4 in the third, 2 in the sixth and 5 in the seventh. Nik Zamora started and pitched 4 innings, He had a rough third inning, letting up 4 runs but pitched almost perfect in the other 3 innings. Jacob Henry came in to relieve in the fifth and pitched 2-plus innings, he gave up 6 runs, only 4 earned then was relieved by Armando Gonzalez for the last 5 batters who gave up 1 run. The defense was solid with only 1 error in the game. Hugo Mendoza was the offensive star again, going 5-5 with a triple, 2 doubles, run, 5 RBI’s and stole home. Armando Gonzalez went 4-4, with a double, inside the park HR, 4 runs and 4 RBI’s. Nik Zamora went 2-3 with a double, 4 runs. Damian Reynoso had a double with 2 RBI’s and Isias Femat went 2-5 with a double, scored 2 runs and 1 RBI. Are the Hornets out of the playoffs? Not necessarily. In the Central Conference, only the top two teams will go. Beatty is tied with Spring Mountain and will need a little help from Tonopah, who plays them this Friday. The Muckers baseball team (8-11, 2-2) was swept by Round Mountain (12-6, 4-0) last week 11-10, 16-5 at home. The Knights remain in first place and Tonopah is still in second place, which means the Muckers’ playoff hopes are still alive too. To remain in playoff contention Tonopah has to beat Spring Mountain (3-6, 1-3) this Friday at least one game. This means Beatty has to take two from Round Mountain, which will be difficult. Batting game 1 Spring Mountain: Armando Gonzalez 3-4, 3 RBIs, 1 run; Hugo Mendoza 2-5, 3 RBIs, 3 runs; Matt Reetz 2-5, 2 RBIs, 1 run; Sam Cardenas 2-3, 2 runs; Damian Reynoso 1 RBI; Isaias Femet 2-5, 2 RBIs, 3 runs; Jacob Henry 1-2. Game 2: Reetz 1 hit, Daniel Jacob 1 hit.